How do I even put this review into words without spoiling this book?! WOW, that is what I felt like when I finished reading this... I almost wanted to re-read it because I think I would have found new information the second time around. 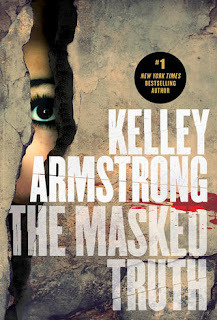 Kelley Armstrong is such a masterful storyteller, for both adults and teenagers. Her stories truly capture your attention, and you absolutely cannot stop reading. I know with this book I put it down at times and then looked at it and had to pick it up again because I couldn't stop thinking about it and the characters. Honestly, this book truly drags you deep into it's pages and you absolutely need to continue to find out what will happen to these kids. I can truly say that I could not predict the things that happened in this story and I was on the edge of my seat trying to figure out what was going on. This is the type of book that you will want to take a day where you have nothing to do and just binge read it (though I feel like that with most of Kelley's books). The cover depicts the creepiness of this book so perfectly, And yet there is so much more to this book than just the kidnapping. This is also a story about recovering from such a traumatic incident... and having people around to help you through such tough times. I loved the relationships that are developed in this story as well, Riley and Max help each other through things despite the secrets hanging between them. Honestly, I can't say much more about this book other than please read it! Kelley Armstrong is an absolutely amazing storyteller, and I can't wait to keep reading what she gives me!